Gough Whitlam became Australia's 21st prime minister when the Labor Party won office, replacing the Liberal-Country Coalition government led by Billy McMahon. 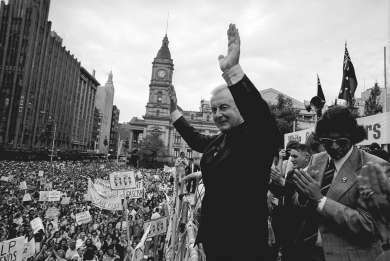 Gough Whitlam considered it his 'destiny' to lead the Labor Party, and the country. He came to office with a detailed reform agenda known as ‘the Program’ and the resolve to implement it. During his rollercoaster years as prime minister, Whitlam established social policies which endured long beyond his government and achieved significant reform of his party organisation. Whitlam was educated at Knox Grammar and, later, Canberra public and private schools. He studied classics at Sydney University in 1935 and reportedly reorganised the college library. In 1941 he enlisted in the Air Force, reaching the rank of flight lieutenant, and became interested in the post-war reconstruction policies of the Curtin government. Whitlam completed his legal studies and was admitted to the Bar in 1947. After standing unsuccessfully in council and state politics, Whitlam was elected in a by-election for the federal seat of Werriwa in 1952. Whitlam became deputy leader to Arthur Calwell in 1960 and clashed on party reform with the executive who he labelled as the ‘twelve witless men.’ Whitlam became opposition leader in 1967 and, on 5 December 1972, was sworn in as prime minister after running an innovative campaign. Whitlam was dismissed by Governor-General Sir John Kerr on 11 November 1975, who appointed Malcolm Fraser as prime minister until an election was called. Whitlam suffered a heavy loss in that election and stayed on as opposition leader. After losing the 1977 election he resigned on 31 July 1978. The Whitlam government is remembered as a period of significant reform which responded to the needs of a changing Australia, but was also characterised by political and economic uncertainty. The Australian government recognises the communist state of China on 21 December 1972. Whitlam had proposed this as early as 1954, and in 1971 travelled to China as leader of the opposition. The Commonwealth Electoral Act is amended to lower the voting age from 21 to 18 on 28 February 1973. This was influenced by the fact that Australians had been eligible for conscription at the age of 18 yet not considered mature enough to vote at the same age. On 25 July 1973 the government announces its intention to establish an Australian Legal Aid Office. The service is to provide free legal advice on Federal law to any Australian who requires it. The Death Penalty Abolition Act to end capital punishment in Australia is passed on 18 September 1973. On 1 January 1974 the government abolishes university and technical college tuition fees and shortly after increased Commonwealth funding for universities to improve access. The Commonwealth Electoral Act is amended on 5 August 1974 to introduce Senate representation for the Australian Capital Territory and the Northern Territory. After the International Convention on the Elimination of All Forms of Racial Discrimination was ratified at the UN in September 1975 the Racial Discrimination Act is passed on 11 June 1975. It outlaws all forms of racial discrimination in Australia and overrides state and territory laws. The Family Law Act introduced on 12 June 1975 establishes no-fault divorce, and stresses equal responsibility between parents to care for their children, the division of property after divorce based on assets and needs, and creates the Family Court of Australia to deal with all related cases. A national health insurance scheme called Medibank is introduced on 1 July 1975. It is designed to offer affordable health care and place pressure on private companies to do the same. 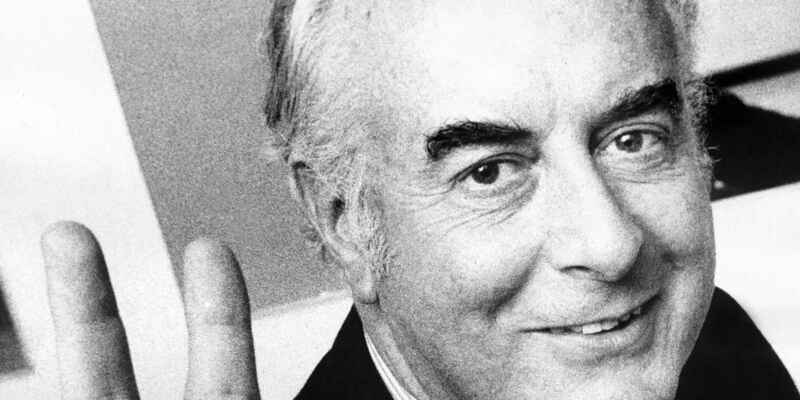 The 1972 election was a landmark victory for the Labor Party and presented an opportunity for Whitlam to bring an end to what he viewed as a long period of policy inertia by previous governments. Whitlam and deputy leader Lance Barnard set to work immediately, sworn in after just three days and operating as a duumvirate ministry that divided every position between them and made 40 decisions within two weeks. Whitlam’s ambitious policy reform impacted on Indigenous Australians, migrants, women and included the introduction of Medibank, new ACT and Northern Territory Senate seats, a new national anthem, Order of Australia honour, as well as the abolition of university fees, the death penalty and military conscription. Whitlam had a strong commitment to parliament and its conventions and a great ability to use it as his stage. Often Whitlam’s outstanding rhetorical skills were not matched by equivalent strategic or tactical skills. In 1973 the House of Representatives sat for over 900 hours, the greatest number in half a century. The Liberal opposition continued to block government bills in the Senate and Whitlam requested a double dissolution election. After the election held on 18 May 1974, Whitlam still did not have control in the Senate and so invoked an unused provision of the Constitution to call an historic joint sitting of both Houses to vote on the rejected bills. The bills were passed on 6 August 1974, but the ongoing turmoil in parliament did not abate. Having led the Labor Party to office after 23 years in the political wilderness, Whitlam pursued his reform agenda with unrestrained urgency. In 1973, the Minister for Labour Clyde Cameron raised concern about the faltering economy. 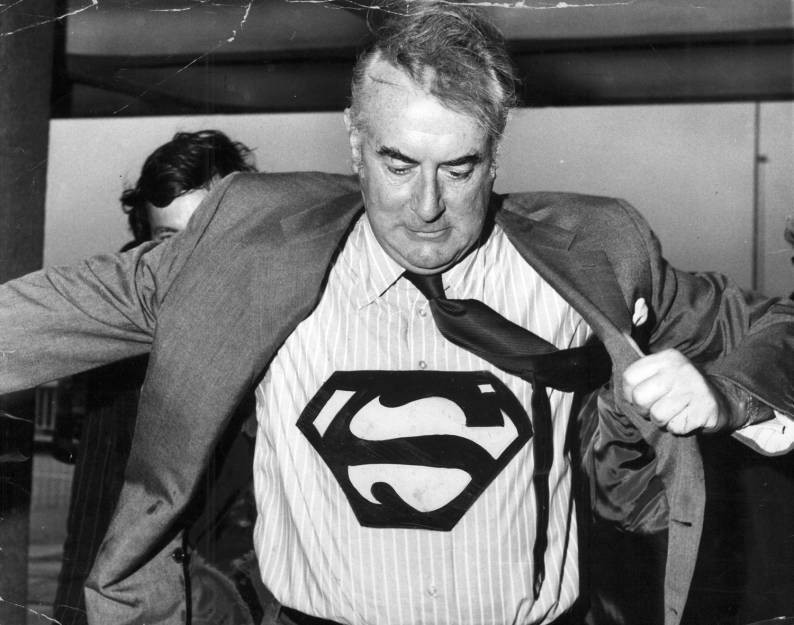 Whitlam responded, ‘What would an ex-shearer know about the economy?’ and Cameron retorted, ‘As much as an ex-classical Greek scholar.’ The capacity of Cabinet to advance reform was inhibited by the caucus decision that all 27 ministers should be in Cabinet, there was to be no inner and outer ministry. Following the double dissolution election in May 1974, party tension increased as the government lurched from crisis to crisis. Rex Connor, Minister for Minerals and Energy, and known for his flamboyant infrastructure schemes, convinced caucus to support his unorthodox plan to raise $4 billion from a Pakistani businessman for mining and energy projects. This became the infamous Loans Affair and led ultimately to the sacking of Connor by Whitlam. Lance Barnard was defeated by Jim Cairns for the deputy leadership after the election, and was given a diplomatic post by Whitlam against the advice of many in the party. This resulted in a by-election routing for Labor in his Tasmanian seat of Bass in June 1975. Cairns also became embroiled in allegations of an inappropriate relationship with Junie Morosi his private secretary. Accumulating scandals, combined with faltering administration, created an atmosphere of chaos and the opposition refused supply in October 1975. This led to a constitutional crisis, an election and a change of government. In his 1972 election policy speech, Whitlam made a commitment to finance sewerage services to all Australian households by 1978. He had first hand knowledge of this issue from his own Western Sydney electorate, where many households remained without this service. In July 1969, Whitlam gave a lecture titled ‘An Urban Nation’ and, with trademark wit, stated ‘Half the population of Brisbane and a quarter of the population of Sydney still live and work in premises which are unsewered. Liberals neglect sewerage services because they are a socialist undertaking. We are the most effluent nation in what Liberals call the free world.’ Soon after assuming office, Whitlam implemented the $330 million National Sewerage Program. Veteran press gallery journalist Wallace Brown recalled being asked to Whitlam’s office in February 1975 to witness a document. Whitlam said, ‘Comrade Joh and I have this historic agreement to sign and we need a witness. It’s St Valentine’s Day and this is a sweetheart agreement on sewerage.’ As requested, Brown added his signature to the Commonwealth-Queensland Sewerage Agreement below those of Whitlam and Bjelke-Petersen. Over a seven year period, the program reduced the number of properties in Australian capital cities without sewerage by around 30 per cent.